Shares in estate agents Purplebricks plunged after it slashed its sales forecast and announced the departure of two senior executives. The company expects sales for the current financial year of between £130m and £140m. Its previous forecast was between £165m and £175m. 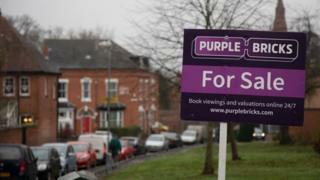 Purplebricks blamed a "challenging" UK housing market and "headwinds" for its Australian business. The chief executives of the UK and US business will both be leaving. UK boss Lee Wainwright is leaving for "personal reasons". No reason was given for the departure of Eric Eckardt, the chief executive of the US business. Shares in Purplebricks dropped sharply on the news, falling as much as 40%, before recovering to close 24% lower on the day..
Will the value of your home change in 2019? Calculator: Where can I afford to live? Purplebricks was launched by founder and chief executive Michael Bruce in April 2014. The idea was to create a lower cost, more flexible estate agent. It charges a fixed fee of £1,399 in London and surrounding areas to market a property. Elsewhere in the country it charges £899. Its agents, which Purplebricks calls local property experts, receive £200 when given a property to sell and £50 when the sale is completed. They also receive viewing fees of £399 in London and £300 outside. Agents can also win commissions for referring buyers to conveyancers and mortgage firms. The company has been expanding rapidly, but has seen losses grow as well. In the financial year which ended in April of last year it reported a loss of £26m, up from £6m in the previous year. In today's statement Mr Bruce said the company was in a good position to take advantage of growth potential in the UK, US and Australia, but added "albeit not entirely as we would have wanted before our year end". The problems at Purplebricks are a "classic case of trying to do too much, too fast", according to Russ Mould, investment director at AJ Bell. "Success in the UK gave management confidence they could take over the world. Alas, that has proved nothing more than a pipe dream. "Efforts to crack the US and Australia haven't resulted in the expected revenues and so the company has been forced to issue a profit warning. "The overseas setbacks will be a huge embarrassment for the company, which has tried to be a pioneering force in the real estate sector." Most experts expect the UK housing market to be sluggish this year. Uncertainty around Brexit is making buyers and sellers cautious, and there is also a shortage of new, affordable homes. In its most recent figures the Nationwide Building Society said house price growth had almost ground to a halt. In January, house prices were just 0.1% higher than the same period last year, Nationwide said. It said uncertainty over the economic outlook was affecting the confidence of buyers.